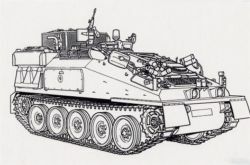 (click image for large view) The Samson is the armoured recovery vehicle of the series and is well equipped for the job. The hull is similar to the Spartan APC. A winch, which is driven off the vehicles engine, is mounted on the interior of the Samson. A spade type rear anchor is attached to the rear of the Samson to assist in anchoring the vehicle in heavy winching operations. The vehicle crew normally consists of three soldiers who specialize in recovery and repair operations. 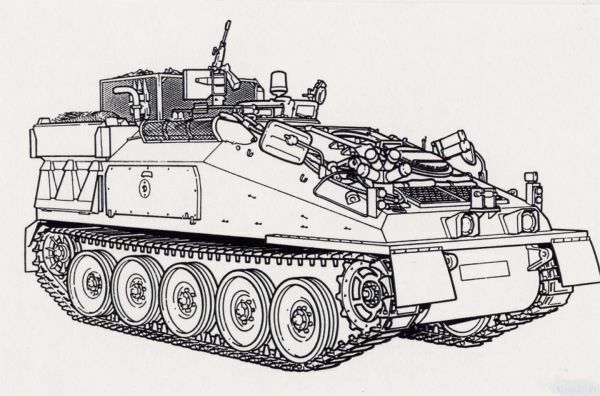 A variety of other gear is carried on the vehicle to include a tow bar, various spare parts, tools, etc… The armament consists of a 7.62mm machine gun and smoke dischargers.